Growth form: Tree. Flowering. Apr–May. Status: Introduced. Very common. Also recorded: Bahrain, E Saudi Arabia, UAE. 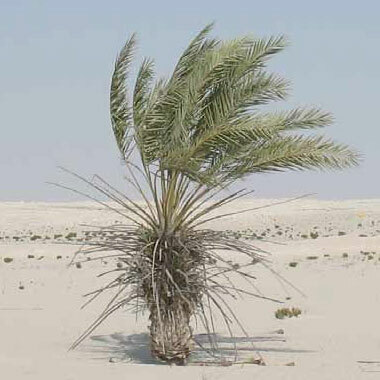 Habitat & distribution: Planted all over Qatar. Naturalised on the coast at Umm Bab. Uses: Cultivated in plantations and gardens, especially for the edible fruit (Debbie Allante); also along roadsides to provide greenery and shade. Various authors describe cultural uses, including making ropes, baskets, roofing and used in the construction of boats and houses. It can also be used as firewood. Jongbloed et al. note that it has medicinal uses.